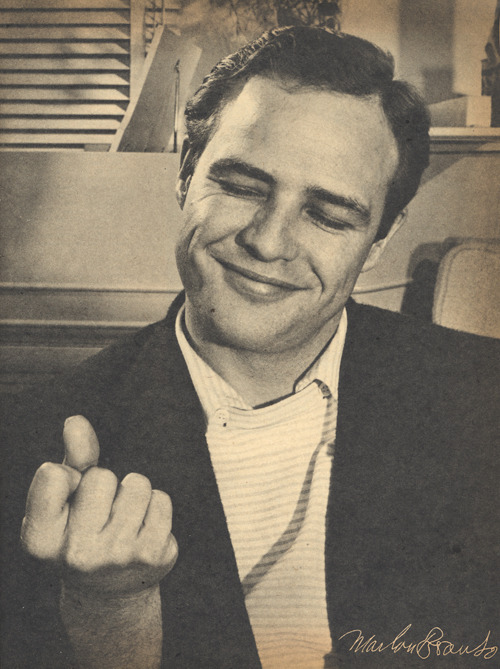 I really wish this Marlon Brando “personal eggs” story over on Dangerous Minds were true. One has to hand it to graphic designer Cris Shapan, though: it’s a helluva good fake. Shapan sets up the story like this: years after his great uncle, Art Berkell, passed away, Shapan found a folder labeled “Joe Flynn” among his effects containing a treasure trove of items related to the Disney stable actor and McHale’s Navy star. There was also a pack of matches labeled “Joe Flynn’s Personal Eggs,” featuring a caricature of the actor, as well as a snapshot of a delivery truck painted in a similar fashion, and other related clippings. I’m thinking, what the hell was this? So Shapan calls up his father. Flynn, he says, raised chickens and used to cook eggs for friends every Sunday morning. Unfortunately, everything changed when actor Wally Cox slipped up and told his friend Marlon Brando about the breakfasts. Brando immediately called Flynn and demanded to be included. Soon, Sunday mornings weren’t enough; he started showing up at Flynn’s door at all hours, demanding his “personal” eggs. As the returns diminished from their friendship, Flynn, in a brazen attempt to exploit their association, published a bizarre, full-page ad featuring Brando’s likeness and apparent endorsement—without Brando’s permission. The copy I obtained was printed in a business monthly published by a local Chamber of Commerce, but I was told that it popped up in a number of Los Angeles area publications and circulated for roughly a year before Brando found out, and he was livid. As hoaxes go this one is excellent. It’s believable enough to be true, but marginal enough to not want to verify. Shapan provides photos, a news clipping, advertisements, a receipt with Brando’s name and actual address on it, as well as letters from lawyers and other actors. It’s all extremely convincing. The first thing that should have set off anyone’s alarm is the author. Shapan, who also goes by Clarington Shpoo, is a designer and visual effects artist on Comedy Central’s Kroll Show who has been designing fake retro print items and videos for some time. These comedy album covers make the rounds from time to time. In 2013 Shapan published a fake Purina cat food ad featuring Brian Eno. The ad lives on, though the original Dangerous Minds post has since been taken down. Now, I’ll admit that I can’t figure out where that photo of Brando came from. It pops up on a number of sites by way of a reverse Google Image search, but I’m not sure of its original context. Flynn played Captain Binghamton, the show’s title is spelled “McHale’s” and, of course, it was a comedy. That seems like an awful lot of missteps, but it’s also down home and folksy enough for a low circulation newsletter. As for Flynn himself, in the summer of ‘74 he was found naked and dead at the bottom of his swimming pool—some say under mysterious circumstances—at the age of 49, and his dream of pre-scrambled eggs for the hungry masses apparently died with him. In the 1970’s, Flynn was instrumental in helping members of the Screen Actor’s Guild receive more equitable distribution of residual payments. A cursory search of the web didn’t turn up any other stories about Joe Flynn’s involvement with SAG residual negotiations, though that only feeds a murderous conspiracy theory, right? One other thing. Shapan’s great uncle, Art Berkell? Now, it’s possible Shapan chose a name at random (or even that that was his great uncle’s name), but there is in fact a Berkell in Los Angeles that would fit the profile of the story. He pops up in articles about George Franklin Smith, “the first pilot to eject from a jet traveling at supersonic speed…and live!” When Smith’s F-100 crashed off Laguna Beach in 1955, “Los Angeles businessman Art Berkell,” who was out in the water fishing, rescued Smith. Turns out Berkell “had captained an air-sea rescue launch, and had fished some 275 downed airmen from the ocean” during World War II. So Shapan’s hoax is a stroke of genius. 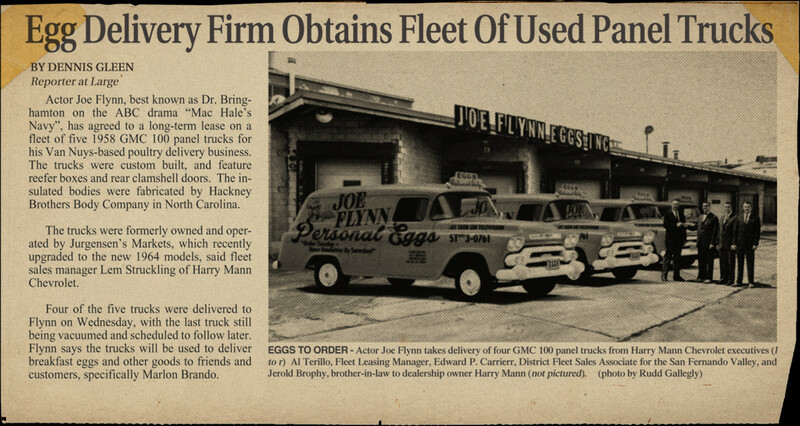 Pulling the thread on the personal egg service actually does yield some strange Hollywood and Los Angeles lore. Which is why I really wish the whole thing were true. But a well-done fake is a story in and of itself, I suppose. Dig into it; there are quite a few nice touches to the story I haven’t mentioned here. Hopefully Dangerous Minds keeps this one up.